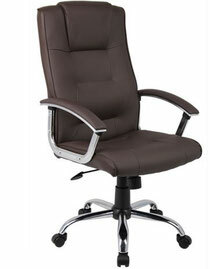 An office chair, or desk chair, is a type of chair that is designed for use at a desk in an office. It should be comfortable and adjustable and can swivel 360 degrees. With the advent of rail transport in the mid-19th century, businesses began to expand beyond the traditional model of a family business with little emphasis on administration. Additional administrative staff was required to keep up with orders, bookkeeping, and correspondence as businesses expanded their service areas. While officework was expanding, an awareness of office environments, technology, and equipment became part of the cultural focus on increasing productivity. This awareness gave rise to chairs designed specifically for these new administrative employees: office chairs. This caught the attention of Otto von Bismarck, who is credited with popularizing the office chair by distributing them throughout parliament during his time in office. The office chair was strategically designed to increase the productivity of clerical employees by making it possible for them to remain sitting at their desks for long periods of time. A swiveling chair with castersallowed employees to remain sitting and yet reach a number of locations within their work area, eliminating the time and energy expended in standing. The wooden saddle seat was designed to fit and support the body of a sitting employee, and the slatted back and armrests provided additional support to increase the employee’s comfort. Like modern chairs, many of these models were somewhat adjustable to provide the maximum comfort and thus the maximum working time. In the 1970s, ergonomics became an important design consideration. Today, office chairs often have adjustable seats, armrests, backs, back supports, and heights to prevent repetitive stress injury and back pain associated with sitting for long periods. Ergonomic chairs fit an individual's needs and provide support where the individual needs it. According to studies, people who sit at their jobs have increased blood pressure and blood sugar, purely from the act of sitting. Your muscles also produce a variety of substances that help metabolize fat and cholesterol. Unfortunately, they only do this when they are being used, and the number of muscles you are actively using when slouched at a desk are minimal.